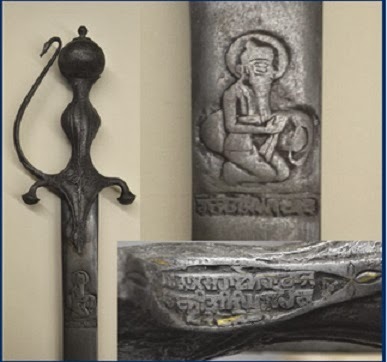 THE SIKH NUGGET: 'Ranjit Singh' inscribed sword bought by Canadian businessman. 'Ranjit Singh' inscribed sword bought by Canadian businessman. Sword with inscriptions bearing the name of the Maharaja 'Ranjit Singh. A Canada-based Punjabi businessman has emerged to be the owner of a sword that the Auction House: Mullocks claims belonged to Maharaja Ranjit Singh.The sword inscribed with "Akal Sahai Ranjit Singh Lahore" on the blade in Gurmukhi, was originally put up for auction last month by Mullock's auctioneers in the UK, but withdrawn at the last minute after it generated huge interest. The mullock website states, This "product went to auction on 18th March 2014 but did not sell". Bob Dhillon, the proud owner of the sword which is described as an early 19th century curved talwar with remnants of gold pitted around the hilt, says he is "absolutely elated". 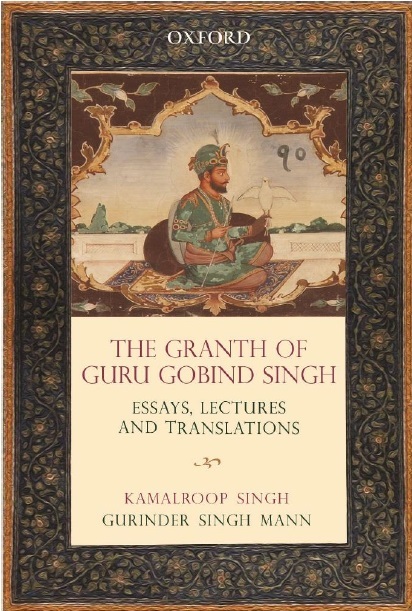 The engraved silhouette on the upper part of the sword depicts Ranjit Singh seated beside a cushion inscriptions. "Initially there were over 700 bidders from all over the world," explains Dhillon in an interview. "Then April 2 there was a private auction with a sealed bid process. The reason for the sealed bid was that a lot of the bidders wanted to remain anonymous; also the final bid amount was to remain private. Close to 175 bidders were international, from Punjab to New York to Mongolia to Hong Kong," he said.We were told on April 3rd that I was the successful bidder on this amazing piece of history. Dhillon says: "I am humbled that after 165 years, my family will be able to help our community become the custodian of our own history. It is probably the first time that such an artefact will be held in Canada and when it comes, you all are welcome to take a look at it." Mullock's auctioneer Richard Westwood-Brookes, who was involved in the original sale, said: "It was a potentially unique piece with historic connections to the most famous of all rulers of Punjab. The fine craftsmanship on the sword indicates that it was certainly of a very high status and there are also indications that when it was first made, the hilt was covered in gold and it must have been a most spectacular piece." Dhillon is the President and CEO of Mainstreet Equity Corp, a real estate company, as well as the owner of National Payments. He is the Honorary Consul General for Belize in Canada and owns 3,000-acre island in Belize, which is being developed into a world-class tourist resort. Reporting by Tribune India, IANS and edited by Sikh Nugget.